With the world’s second-largest ice-free harbour at our fingertips, Halifax and Nova Scotia have committed our region to becoming global leaders in ocean technology. A key part of that strategy is the new Centre for Ocean Ventures and Entrepreneurship, using the existing Dartmouth Coast Guard Base. An initiative supported by many partners, COVE is designed to bring the best of ocean technology innovation and advances to life right here in Halifax. 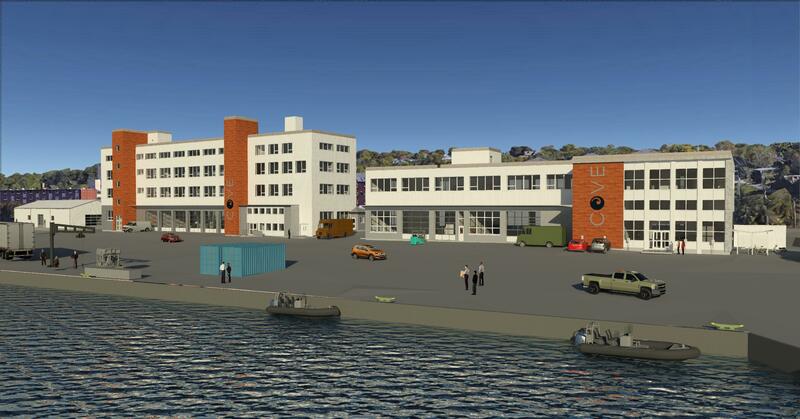 To make COVE a reality, the 60-year-old Coast Guard buildings required significant renovations and modernization to become a marketable facility and space for companies looking to become ocean technology leaders. EastPoint worked collaboratively with Halifax Waterfront Development Ltd., Nova Scotia Community College, as well as the Institute for Ocean Research Enterprise (IORE) to define the standards required, operational program needs, and support systems. Since this project also required quick delivery, EastPoint worked with construction managers, PCL, to define specific trades packages for sequential tendering. As part of the collaborative efforts with both construction managers and partners, EastPoint assisted in developing construction budgets and assessed options to maximize return on both schedule and effective components. The three COVE buildings total 5,700 m² of interior renovations, new exterior cladding, and support systems. Additionally, exterior civil/site re-grading, new sewer and water services, as well as updated electrical and communications systems were included. The systems and base building infrastructure is designed for a minimum life span of 20 to 25 years. Together, COVE and EastPoint have created a space that will attract global attention, and bring our region to the forefront of ocean technology today.